7th ISZB meeting is around the corner. The meeting will take place in Aachen, Germany, on September 20-26, 2020. Save the date! 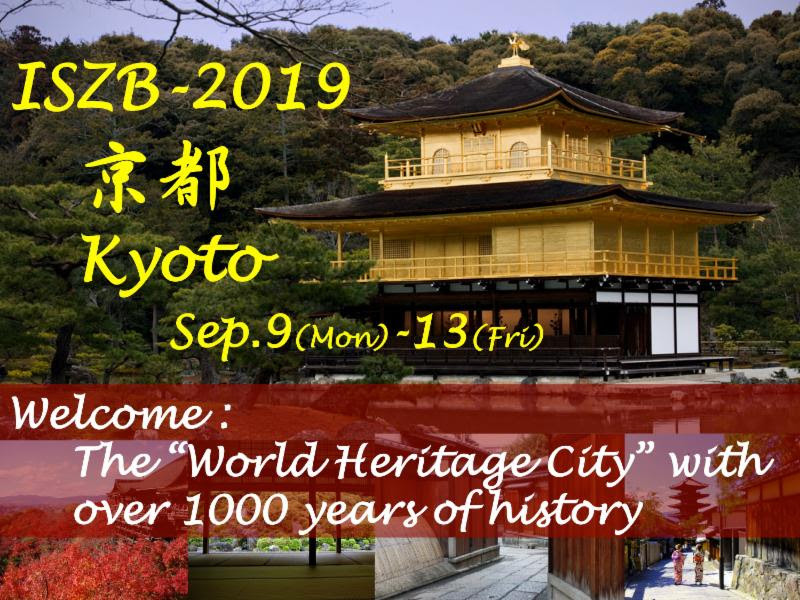 The 6th meeting of the International Society for Zinc Biology will be held on September 9-13, 2019 in Kyoto, Japan. The conference will be organized by Toshiyuki Fukada (Chair), Taiho Kambe (co-Chair), Atsushi Takeda (co-Chair), Hiroyuki Yasui, and Keigo Nishida. All aspects of zinc biology will be covered in the conference. See you there!! The 2017 meeting was held in UCLan Campus, Pyla, Cyprus in collaboration with Zinc-NET (COST Action TD1304). The meeting was organized by Nicola Lowe, Kathryn Taylor, Belma Turan and Michal Hershfinkel. The opening keynote lecture was given by the first President of the ISZB, Professor Glen K. Andrews (University of Kansas School of Medicine, Kansas City, MO, USA) who gave tribute to founders of the field of zinc biology. Glen recognized the studies that identified the metallothioneins, and then zinc transporters and mentioned some of his seminal works in the field. Professor Hidenori Ichijo (Graduate School of Pharmaceutical Sciences, U-Tokyo, Japan) discussed the response of copper/zinc superoxide dismutase (SOD1) to zinc deficiency and stress and how these affect neuronal survival. Professor Stephen J. Lippard (Massachusetts Institute of Technology, Cambridge, MA, USA), a leader in development of tools for imaging zinc in biological systems. Steve described his contributions to synthesis and application of zinc probes as tools in the study of mobile Zn2+. Professor Ismail Cakmak (Sabanci University, Istanbul, Turkey) described several agricultural strategies to fortify grains with zinc, to make this ion bioavailable in human nutrition. The 2014 Meeting of the ISZB was held in Asilomar Pacific Grove, CA, USA. The meeting was organized by Diane Ford and Daren Knoell together with the the ISZB president Wolfgang Maret and the secretary Robert Colvin. The meeting was attended by nearly 175 scientists from 16 countries from the Americas, Europe, the Middle East, East Asia and Australia. Topics covered in the meeting included the genetics and structure/function relationships of zinc transporters and binding proteins, the physiological functions of zinc in yeast, bacteria, nematodes and mammalian models, as well as the nutritional, pharmacological and toxicological aspects of zinc in humans. Finally, bioinorganic chemistry of novel tools aimed at revealing the biology of zinc was also discussed. A keynote speaker and a session were devoted to nutritional issues, and the measurement of zinc in humans. While it is well accepted that zinc is essential from proper function of numerous systems, how it is measured and what are the required concentrations remains a challenge. A link to inflammation and the activity of the immune system is an important aspect of nutritional zinc that was also addressed in the meeting. This discussion was the beginning of what we expect will be a major focus in the coming years. Several sessions discussed roles of zinc transporters, their regulation function and physiological roles. It is now clear that our community has matured and addresses more focused questions in this field. As such, roles of the transporters in zinc toxicity and in fighting it were described, developmental roles of the transporters was suggested and their function in disease, mental disease, kidney stone formation and even a link to prion proteins. A zinc meeting would not be complete without sessions on neurological role of this ion. Novel and exciting results on the roles of synaptic Zn2+were presented, showing it is regulating NDMA receptors, functions in memory and learning processes and is regulating nerve process regeneration. Zinc signaling also plays an important role in epithelial physiology, interesting studies on the role of zinc transporters in mammary tissue were presented. A role for zinc in digestive system function via the zinc receptor, ZnR/GPR39, as well as the zinc uptake transporters Zip4/Zip5 was discussed. And finally, a role for zinc-dependent wound healing was described. The 2012 Meeting of the ISZB was held in Melbourne, Australia on January 15-19, 2012. The meeting was organized by Paul Adlard, David Finkelstein and Ashley Bush, together with the meeting committee chaired by Stephen Lippard. The meeting was attended by about 150 scientists interested in a variety of aspects of zinc biology. Among other activities the attendees had an exciting visit to Melbourne zoo, an Aussie BBQ and a local bowling game. The beautiful beach of St Kilda with its penguins served as the background for this meeting. Among the topics discussed at the meeting were the importance of zinc homeostasis and the hurdles of determining the affinity of zinc to proteins, the cellular levels of this ion and its sequestration into organelles. An interesting session was devoted to measurement of zinc ions in cells and novel probes and sensors were presented. Zinc transporters serve as important regulators of cellular zinc levels. Regulation of Zip transporters via their phosphorylation was suggested, and the role of the transporters in regulating zinc and cellular signaling was described. Zinc homeostasis plays a major role in neurodegenerative diseases, various aspects of dysregulation of cellular and extracellular zinc in Alzheimer’s disease have been presented. A perspective on the research of zinc in Alzheimer’s disease was presented. Synaptic zinc that is released under physiological conditions was shown to regulate inhibitory and excitatory pathways. A special session was devoted to the studies of Chris Frederickson on the role of zinc in the brain, and the Frederickson prize was granted to McNamara and Lippard for their work on vesicular zinc regulation of LTP in the hippocampus. Zinc transport is of fundamental importance in pancreatic function and affects diabetes. The role of ZnT8 mutations in this disease as well as on the cellular level was described. Other ZnT transporters regulate mammary gland functions under normal conditions and changes in the transporters repertoire is linked to breast cancer development. Finally, the role of zinc ions in cellular signaling, and cell death of epithelial cells in the lungs and intestines were described. As is now a tradition of the ISZB meetings, the best posters presented by students were selected by a committee and won the ISZB award. The first prize: Russell Carter for his poster “Synaptic Zn2+ release in neocortical tissues during spreading depolarization in vitro and cortical spreading depression in vivo”. The second prize was divided between: Genevieve Park on her poster “Development of genetically-encoded fluorescent zinc sensors to study cellular zinc Homeostasis” and Da Wang on the poster “Measuring Readily Exchangeable Intracellular Zinc in Escherichia coli Using Genetically Encoded Ratiometric Zinc Sensors”. The 2009 meeting of the ISZB was held at Mishkenot Sha’ananim in Jerusalem, Israel on December 1-6. The local organizing committee, composed of Israel Sekler, Ze’ev Silverman, Michal Hershfinkel and Jonathan Friedman, worked in conjunction with the ISZB meetings committee, chaired by Elias Aizenman, to put together a rich and interactive scientific and cultural program. Over 100 scientists attended this meeting, sharing new data and ideas regarding the role zinc plays in a large number of biological systems. In addition, attendees were introduced to the rich and varied history of Jerusalem during three comprehensive guided visits to the old city. Here, we would like to highlight some of the many topics covered during this most recent gathering of the leading zinc scientists in the world. Tools for studying cellular zinc homeostasis are essential, and an exciting and stimulating session was devoted to describing novel molecules and methodologies for Zn2+ sensing. New approaches for localization of fluorescent probes, dynamic and fast detection of intracellular Zn2+ and its release, as well as probes for different imaging methodologies were detailed. We later learned about methods to assess the levels of this ion in specific cellular compartments, and to start addressing the role of networks activated by movement of Zn2+ ions. On the cellular level, several sessions addressed the important roles, as well as the mechanism of function, of various zinc transporters. In these sessions we learned about the interaction between intracellular Zn2+, transported into the cells via Zip proteins or released within the cells, and signaling pathways that are activated during cancer, autophagy, or activation of the cellular immune response. We also discussed the role of Zn2+ transporters in regulating Zn2+ metabolism in organ and tissue system, such as the mammary gland, connective tissue, and bone development. A stimulating presentation highlighted a potential new role for Zip4 and Zn2+ accumulation in cancer progression. Finally, the role of Zn2+ transporters diabetes, mood disorders, inflammation, digestive system function and age related macular degeneration was discussed. A fascinating plenary lecture by Prof. Bruce Pitt from the University of Pittsburgh addressed the role of Zn2+ in activation of cellular pathways in pulmonary endothelial cells, affecting formation of stress fibers linked to vasoconstriction in the lungs. Of course, no ISZB meeting would be complete without a rich complement of sessions centered on the role of Zn2+ in neurological disease. Zinc-regulation of potassium or calcium channels was shown to affect neuronal behavior during ischemia or epileptogenesis. Important new data regarding the role role for Zn2+ in regulating NMDA and GABA pathways was presented. Dynamic regulation of Zn2+ levels was shown to be determined by both sensory experience and by injurious spreading depression. The critical role Zn2+ may play in Alzheimer’s disease progression was also covered during the meeting. In an interesting opening lecture, Prof. Ilana Gozes from Tel Aviv University described the beneficial role of the peptide NAP, which also protects cells from zinc toxicity. Exciting new developments regarding the role of intracellular or synaptic Zn2+ on learning and memory as well as the effect of chaperones of this ion on cognitive function were presented. Last but not least, four outstanding trainees were chosen to present their work and won ISZB awards: Elisa Tomat presented her work on Zn2+ detection, Benjamin Weaver presented his work on Zip5 translation, Veronica Lopez presented her work on the role of Zn2+ transporters in breast cancer and Rosa Puce presented her work on the role of Zn2+ in regulating p53 signaling and chemoresistivity. The ISZB continues to provide a wonderful venue for cross-disciplinary interactions among zinc scientists. Jerusalem provided a rich venue for our young society to continue to grow. We anxiously await the next ISZB meeting! The inaugural meeting of the Society for Zinc in Biology, organized and presented by Drs. Katalin Toth and Richard Dyck, was held at the Banff Centre, in Alberta, Canada. This very successful meeting brought together more than 100 scientists studying zinc biology in a variety of fields. This brief overview will highlight only part of the excellent presentations, and we apologize for omitting some of the equally important topics. Among the topics covered were the mechanism, function and regulation of zinc transporters, roles of synaptic Zn2+ and its regulation of numerous ionotropic as well as metabotropic pathways, intracellular regulators and modulators of Zn2+; zinc dyshomeostases and their contribution to cell survival or death. Finally, nutritional aspects of zinc deficiency were addressed. Cellular zinc homeostasis is mediated by multiple zinc transporters and proteins, such as metallothioneins. The regulation of their expression in mammalian systems as well as in zebrafish were discussed, structural aspects of their function and results from modeling were also addressed. Aspects of dynamic zinc changes and their crosstalk with calcium signaling via multiple calcium channels and receptors were presented. Throughout the meeting Zn2+ dyshomeostasis was shown to play an important role in major pathologies ranging from epilepsy to diabetes and cancer. Thus, the role of zinc rise in ischemia as well as effects of zinc on white matter injury or regulation of the immune response were presented. Changes in expression and function of Zn2+ transporters in breast cancer, cardiac cells or the pancreas were discussed. In addition, the role of Zn2+ in facilitation of epileptic activity, acting directly or as a signaling molecule and therapeutic aspects of Zn2+ chelation in Alzheimer’s disease illustrated clinical aspects of Zn2+ biology. A particularly important session for all Zn2+ researchers dealt with powerful new imaging tools. The need for precise methods for monitoring actual zinc concentrations was raised, together with the concern that chelators and fluorescent dyes are used at non-specific concentrations. This problem will continue to occupy zinc physiologists for the foreseeable future. In this session novel chemical or protein based zinc probes were presented, these can be targeted to specific cellular compartments and will facilitate more quantitative and localized assessment of zinc homeostasis in subcellular compartments. Finally, a diverse poster session provided a stimulating interaction between students and established researchers. Prizes for outstanding presentation were made to two students: Mandar A. Aras from the University of Pittsburgh for his talk titled: “Death: Zinc’s role in ischemic preconditioning” and to Jan Vinkenborg from the Eindhoven University of Technology for his talk titled: “Protein-based zinc sensing with high affinity and improved ratiometric response”. A key moment for the Society for Zinc Biology came with the creation of a board which will define the future goals and lay the groundwork for the next meeting. From the high level of research presented in Banff and the tremendous enthusiasm generated by the participants, it is clear that the Society for Zinc Biology has a bright future indeed.